What’s It Like Being a Nurse or RN? Maddie, thank you very much for your question. It is really good that you are wanting to explore and find out what a nurse does before you actually try to attain the degree. I have seen many people (who I have gone to school with) who thought nursing was for them but ended up not liking it because they had a different idea of what nursing was. Here are a few suggestions: Even though you have been to a hospital before, did you participate in giving care to the patients and spend a whole working day with a nurse? If you haven’t I suggest very strongly that you do what is called “shadowing”. Almost every hospital has a thing where you spend the whole day with a nurse and work with him/her to get a feel of what the job offers. I suggest you think of a field you might be interested in nursing(such as Pediatrics, Labor & Delivery, Health Clinic work, Intensive Care Unit, Emergency Room, Medical Surgical (you see a variety of patients from gun shot wounds to pneumonia), Operating Room….etc and “shadow” in one of these areas. So get on your local hospital’s website or call the hospital and ask how you go about signing up to shadow a nurse. 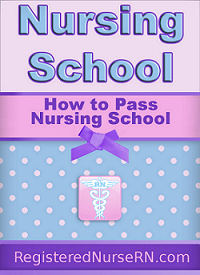 I think that is where you will get the answer to your question and it will help you decide if nursing is for you. Also, to give you an idea of what a nurse does I can explain to you how my day goes when I work in clinicals with my preceptor. I work on a Cardiac ICU (intensive care unit) step-down Unit. I arrive at 645am and look on the board to see what patients I have for the day. Then I find the nurse who had the patients last night and get what is called “report” from them. It consists of history of the patient, diagnosis, current condition, labs, test, procedures schedules, IV access…etc. Then after that I find that patients chart (we still don’t have computerized charting yet…getting there) and look at it to see if we missed any thing in report. Then I do my morning assessment (consists of listening to lungs, heart, bowel sounds, checking pulse, blood pressure, edema (swelling), Range of Motion, Level of Consciousness, IV site…etc). Then I document everything in the patients chart I found. I usually have 3-5 patients for the day. So I do this with each patient. Then by the time I’m done with everything it is time to pass 1000 am medications. After that I review charts to see if there are any new doctor’s orders and put them into the computer. Then I Draw blood (if needed) for new lab work (and this can take time if the patients has bad veins), change wound dressing, rotate IV sites (if needed IV sites expire in 4 days), flush IV lines, flush PICCs, change dressings & caps on PICCs, ambulate (walk) patients, pass more medications…etc. Then you have to chart everything you do. You will notice there is a lot of paper to work to do on patients. Then before you know it is 645pm and it is time to get “report” ready to give to the night shift. That was a down and dirty day of how my day goes…of course it is not everything but it sort of gives you an idea of a floor nurse. I wish you much luck with your decision regarding nursing and I hope you decide to shadow a nurse because it will really help you. lso, keep in mind that nursing salaries are pretty good too. Thank you again for your question and good luck! If you have any other question don’t hesitate to hit me up.